When software goes arm-wrestling. Also, backing up LastPass, and fixing browser home pages. Every so often I like to find out what's on your mind. Please click here to answer one simple question. Your response will help make sure I keep Ask Leo! as relevant as I possibly can for you. I experienced Macrium Reflect taking a long time to perform its backups. I discovered that if I end task OneDrive Sync Engine in Task Manager it reduced run times from hours to minutes. This isn't an isolated report, and highlights something important to consider when troubleshooting slowdowns, delays, and other problems. Software like OneDrive and Macrium Reflect is complex. Running multiple complex applications at the same time increases the demands on your machine tremendously. I want to be clear about something: it really shouldn't matter. Macrium Reflect and Microsoft OneDrive should be able to co-exist happily without adversely impacting one another. On my machine, for example, they're quite happy together, and I suspect that's true on most machines. While they're involved in the example at hand, I want to be clear that this isn't really about Macrium Reflect and Microsoft OneDrive. Almost any combination of software can interact in unexpected ways and have unintended side effects. That's what make diagnosis so difficult sometimes. We all know by now that having multiple anti-malware tools installed simultaneously is generally okay. However, having more than one actually running at the same time is a recipe for unintended side-effects. The result can be false positives, missed detection, or even program crashes. This is why most anti-malware tools either complain about or explicitly disable any pre-existing tool if it's noticed at setup time. Sometimes it's surprising things actually work. For example, I have Dropbox, Google Drive, OneDrive, and SyncThing all installed and running on most of my machines. They all work flawlessly, even though they're essentially doing the exact same thing: synchronizing files across machines and cloud services. I expected conflict, and there's been none. Had one of them been unreliable, disabling the others would be on my diagnosis checklist. Understanding that some software might not play well with other software is important when you're diagnosing a problem. Eliminating likely suspects by exiting, disabling, or, in the worst case, uninstalling, can provide valuable information if the problem you're experiencing suddenly goes away. The problem, of course, is understanding what the “likely suspects” might be. I probably wouldn't have considered OneDrive with respect to backup slowdowns, though I certainly will now. In fact, hearing that Reflect might be sensitive to other software working “in the background” while it does its job will prompt me to look at what else is going on whenever I hear reports of it taking too long to back up. Can OneDrive and Macrium Reflect co-exist? This isn't really about OneDrive and Reflect, specifically, but examining them can give us a window on to the complexity of the situation. On one hand, it seems plausible that OneDrive might confuse Reflect. If OneDrive is changing files that Reflect is backing up, or downloading files while Reflect is backing up, it could make sense that Reflect never sees itself as “done” because things keep changing. Or it could be some other conflict as both pieces of software attempt to access some important resource and keep blocking and slowing each other down. Or it could be a setting in one that somehow adversely impacts its behavior when the other is running. Or some other characteristic of this person's machine may be causing either or both programs to misbehave. I have no idea whether any of those scenarios are the case. But knowing that shutting down OneDrive had a dramatic impact on the performance of Reflect on this person's machine would help narrow my search down to issues that might relate. And to reiterate, it's on this person's machine. In general, OneDrive and Reflect work just fine together. But knowing there might be an interaction aids diagnosis of similar scenarios in the future. This is one of the reasons I ask for as much information as possible when asked a question. It's also why my first response is often to ask for even more. If you find yourself faced with an unexpected problem or behavior on your device, consider the big picture. Think about what else might be going on that could potentially relate to whatever you see. If there's a way to eliminate it, consider doing so to help simplify what's going on. These are complex systems we're dealing with, and the potential for interactions and unexpected side effects is dramatic. Some days, I'm surprised things work at all. The Ask Leo! Tip Of The Day! An emailed tip six days a week to help you use your computer, and your technology, more effectively and with more confidence. Includes online access to all previous tips, as well as Ad-Free Ask Leo! There's something for everyone, from beginner to the experienced computer user. By popular demand: now available as a monthly or annual subscription. Support Ask Leo! 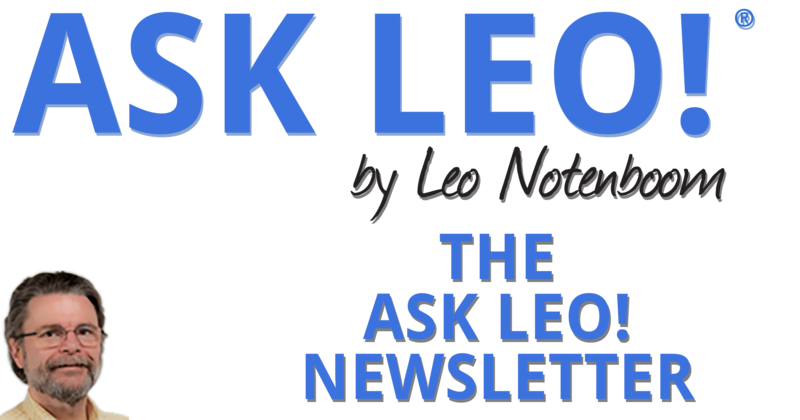 by purchasing a subscription to The Ask Leo! Tip Of The Day. How Do I Back Up LastPass? I've long recommended password managers like Roboform and LastPass to keep track of passwords for all online accounts. Besides offering an incredible level of convenience, these tools give you a greater level of security by making it practical to use truly long and complex passwords and generate different ones for every site. But, as with all things relating to security, there are risks. For example, what happens if you forget your LastPass master password? Master passwords cannot be recovered. While there are a couple of options that might regain access to your password vault, the worst-case scenario is that you lose the vault — and everything in it — forever. Not to keep beating the same old drum, but the best solution is very simple. Continue Reading: How Do I Back Up LastPass? How Do I Change My Browser Home Page Back to What I Want? I upgraded my browser, and I've always had MSN as my homepage. Now, suddenly, the MSN homepage is all changed and I hate it. Can I change it back, and if so, how do I do it? When your browser's home page changes, there are two possibilities at play: the home page setting in your browser has been changed, or the content at the home page you've selected has changed. I'll look at both, and what you can and can't do about each. 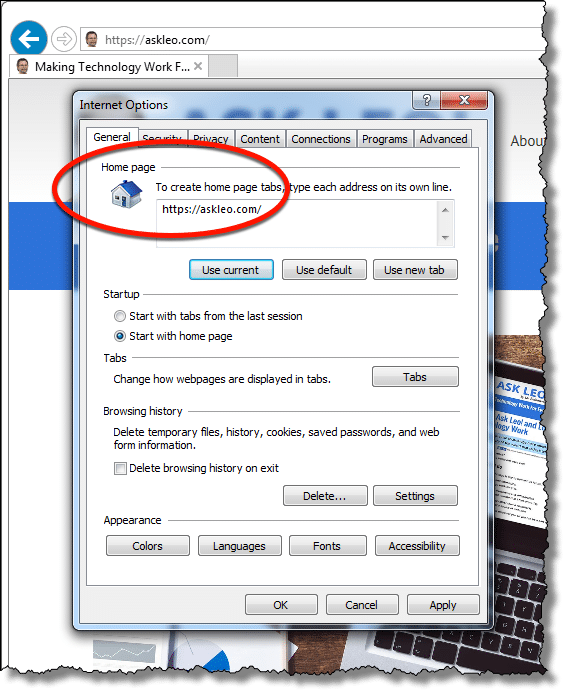 Continue Reading: How Do I Change My Browser Home Page Back to What I Want? A feature exclusively available to Ask Leo! Patrons Bronze level & above. Tip of the Day: JPG or PNG? HeroicStories Since 1999, HeroicStories brings diverse, international voices to the world ' reminding us that people are good, that individuals and individual action matter. Stories - new and old - are published twice a week. Not All News Is Bad - Each day I look for one story in the current news of the day with a positive bent. Just one. And I share it. leo.notenboom.org - My personal blog. Part writing exercise, part ranting platform, it's where I write about anything and everything and nothing at all.